Getting an experiment up and running takes a lot of hard work, but getting an experiment up and running ahead of schedule and under budget is a Herculean feat. The MINERvA experiment, which studies what happens when neutrinos interact with matter, came in 9 percent under budget and was already installed by the time the collaboration received CD-4, the last step in the DOE approval process. The collaboration consists of 100 physicists from 25 institutions. 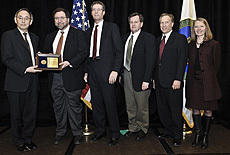 Steve Webster, the federal project director for MINERvA, and his colleagues in the DOE Fermi Site Office recommended the project for the award. 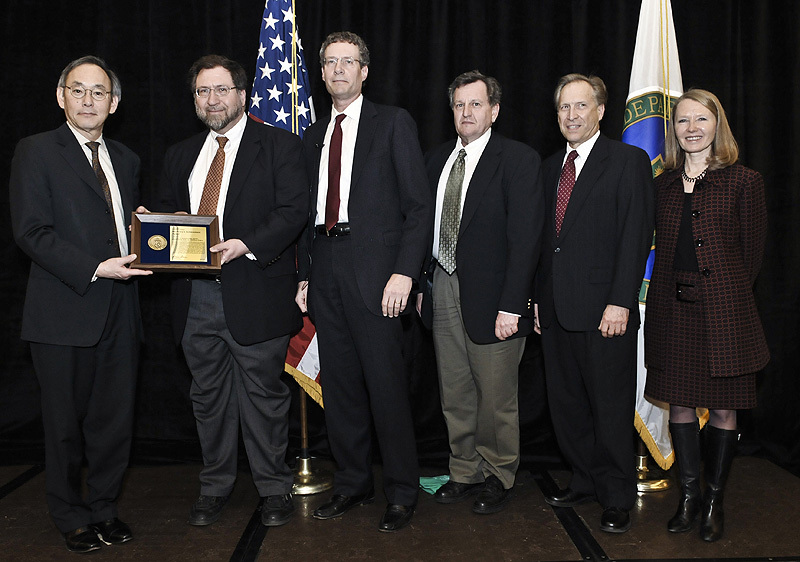 Deputy Project Manager Bob DeMaat, who accepted the award for the group at the 2011 DOE Project Management Workshop in early March, attributed the experiment’s success to the collaboration. “The MINERvA project brought together a diverse group of talented people from many institutions across several continents, all of whom benefitted from exemplary leadership by Debbie Harris, our project manager,” DeMaat said. 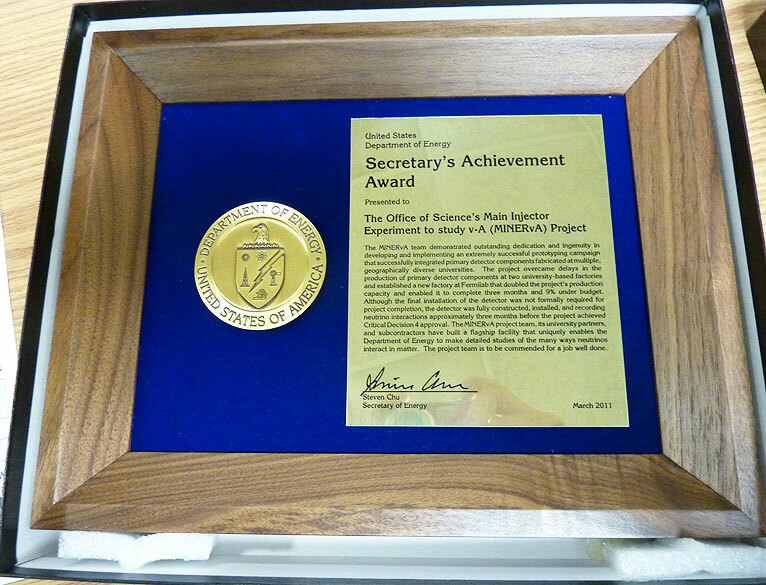 The award citation commended the MINERvA collaboration for its “outstanding dedication and ingenuity” and overcoming production hurdles to build a “flagship facility” that enables DOE to study neutrino interactions in detail. Editor's note: More than 30,000 particle accelerators are at work in hospitals, factories, shipping ports and laboratories. Historically, breakthroughs in accelerator science come from basic research, leading to applications for diagnosing and treating disease, cleaning polluted air and water making greener industrial processes. Next-generation technology such as the EMMA accelerator will help pave the path for even more applications. Learn more about the applications of particle accelerators. A brand new technology that promises a range of applications from treating cancer to powering safer nuclear reactors has reached another world first in its development. This milestone was confirmed yesterday, 31 March 2011, at the Science and Technology Facilities Council's (STFC) Daresbury Laboratory in Cheshire. Scientists from across the world are celebrating the successful start up of the pioneering EMMA accelerator which is set to impact fundamental science and change the way such particle accelerators across the world are designed and built in the future. EMMA is a proof of principle prototype for a brand new type of particle accelerator, designed by an international team of scientists, including a number of the UK's top universities and institutes. A major part of the BASROC CONFORM project, EMMA is funded by the Research Councils UK (RCUK) Basic Technology programme. A supporting statement and quotes from the CONFORM project and its members is available here. As Fermilab has done traditionally, we will celebrate Arbor Day this year in the beginning of May. The adjusted schedule allows our tree planting to take place when the weather is warmer. Arbor Day is a chance to get out of the house or office, plant a tree or two at Fermilab and share a picnic lunch to celebrate spring and the importance of trees in our ecosystem. It is also an opportunity to assist in the ongoing effort to manage the natural areas on our site in a responsible and ecologically sound manner. During the last 20 years or so, the effort to restore tall grass prairie at Fermilab, initiated by Dr. Robert Betz in 1975, has evolved into a larger effort focused on whole-ecosystem management. This management philosophy recognizes that ecosystems are complex, interacting systems and that the dynamics of the individual parts of the ecosystem are often very complicated. 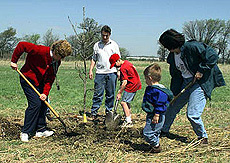 For the last 17 years, Arbor Day at Fermilab has concentrated on planting native species of trees and shrubs in the area south of Wilson Street and west of B Road, in the northwestern part of the site. This location was chosen based on the ecological principle of minimizing forest “edge” with surrounding grasslands to reduce fragmentation of the adjacent forest of the Big Woods and the Director’s Woods at Site 29. When large, contiguous forests are fragmented by timbering, roads or agriculture, the smaller remaining fragments are much more vulnerable to invasion by predatory and parasitic species such as blue jays, crows and cowbirds as well as cats and raccoons. This degrades the forest habitat for sensitive deep-forest bird species in particular, such as ground or mid-level nesting birds. Other specialist species that can be affected include amphibians and beneficial insects. Reuniting the fragments by filling in creates more high-quality habitat characterized by deep forest and restores the balance once again. Neutrinos have been the darlings of poetry, the destructors of the world in science-fiction films, the names of companies, rafts and more. These ghostly particles generally come from the sun and travel through nearly everything. So, how exactly does Fermilab create and study these ghostly particles? Join Fermilab at 12:30 on Wednesday, April 6, to learn about neutrinos, including where they come from, how they fit into the field of particle physics and what neutrinos might be able to tell us about the universe. In his talk, titled “In one ear and out the other: a neutrino talk” neutrino scientist Dave Schmitz will also explain what Fermilab experiments are trying to learn from these elusive particles and how they’re getting that information. The lecture is free and open to the public. It will take place in Ramsey Auditorium. No registration is required. There will be time for questions and answers. The lecture is part of a non-technical series about Fermilab science and culture. View previous lectures here. Do you have a foreign bank account outside of the U.S.?